Specimen kindly loaned by Dr. Martin Luff Occurs throughout England, Wales and Scotland including the Western Isles but not yet recorded from Orkney or Shetland, records also from Anglesea, Man, Lundy and there is an old record from Scilly, despite many records from south Hampshire there are none from the isle of Wight (Luff, 1998). From the records it appears more frequent in the north of England but, frustratingly, there are records from around the south Herts area. The species occurs on open grassland, moors, heather etc. but also by rivers and so we should expect to find it locally. Adults occur from May to September and the species is a spring breeder (Luff ibid). The search continues. 5-6mm. Form elongate and somewhat narrow. 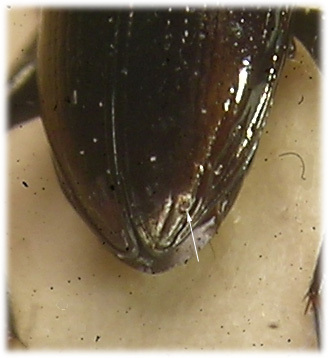 Upper surface dark with strong metallic reflection, bronze or coppery and most pronounced on head, least so on elytra, apex of elytra occasionally lighter but without definite pale markings (cf N.biguttatus). Head as wide as or very slightly narrower than pronotum, carinae parallel between deep longitudinal furrows which do not contain punctures. Base of head densely microgranulate with a few very fine punctures laterally. With a single setiferous puncture beside eyes and one in a short transverse furrow either side of middle along base of clypeus, clypeus with two anteriorly converging longitudinal furrows. Labrum densely microgranulate with smooth and shiny anterior edge. 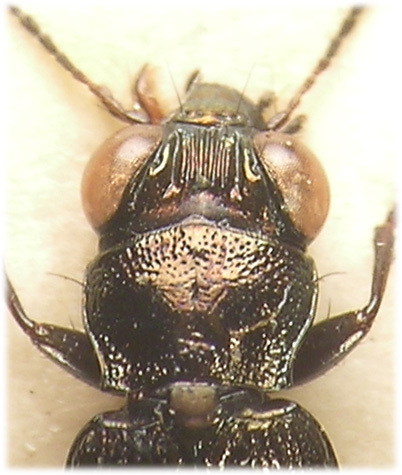 Antennae dark with four basal segments rufinistic, at least below. Pronotum weakly convex, anterior lateral declivity strong, weakly rounded and strongly constricted to base, side borders well developed. Strongly punctate around edges, punctures somewhat confluent laterally, especially near middle, cuticle smooth and shining (X20). Basal fovea well developed, hind angles sharp and slightly acute. Scutellum microgranulate with metallic reflection. 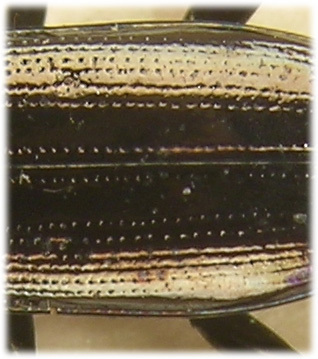 Elytra relatively narrow, strongly bordered at base and laterally, striae deeply punctured and apical declivity steep (cf N.aesthuans). Second interstice about as wide as third and fourth combined, all interstices smooth and shining although there is some weak microsculpture subapically. With a single foveate preapical puncture although there may (rarely) be an extra, rudimentary, puncture anterior to this (Lindroth, 1974), and another in the fourth interstice before middle. 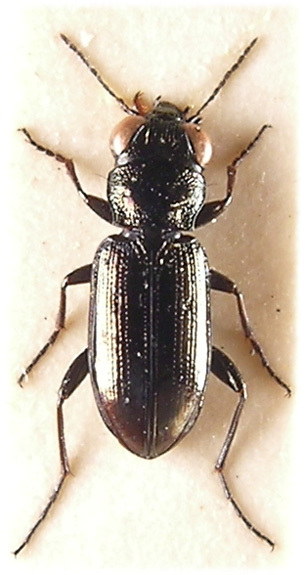 Legs entirely dark; femora black and metallic, tibiae and tarsi may be obscurely lighter; very dark brown.